Dreamgates may be more of a treasure map than a book — in the world of dream navigation, think “X” marks the spot for one jewel after another. Anything from Robert Moss is good, but this is one of his best. Originally published in 1998, and now newly reissued, Dreamgates is already a classic that rewards re-reading and greater study. New readers are in for a major treat. This is the guide book for anyone who is interested in dream work and soul exploration. There are a variety of techniques, exercises and meditations for getting to different states or to achieve specific outcomes, and they are all spot on. You can use these exercises to heal yourself and others, communicate with loved ones who have passed over, gain insight from your spirit guides, increase creativity, and more. Even better are the author’s illustrations of how dream work becomes meaningful in the waking state — and highlighting the relevance of this work to our waking world today may be more important now than when the book was originally published. Dreamgates may offer readers a critical navigational tool at a time when many are confused and foundering. 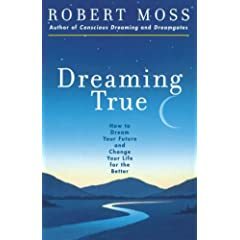 Robert Moss leads innovative programs all over the world and is actively engaged in research projects that include the applications of conscious dreaming techniques to healing and care for the dying; creative innovation and conflict resolutions; dream education in schools; and future science. His many publications include Conscious Dreaming: A Spiritual Path for Everyday Life (Crown), Dreamgates: An Explorer's Guide to the Worlds of Soul, Imagination and Life Beyond Death, Dreaming True, the novels The Firekeeper and The Interpreter, the popular audio series Dream Gates: A Journey into Active Dreaming (Sounds True), The Dreamers Book of the Dead, The Three “Only” Things — tapping the power of Dreams, Coincidence & Imagination and The Secret History of Dreaming.